Over the last few years, I’ve developed a fascination with stone sculptures. Fortunately, for me, there are plenty to be found in Portugal. It’s only recently, however, that I’ve realised that much of the craftsmanship I admire belongs to Romanesque architecture. 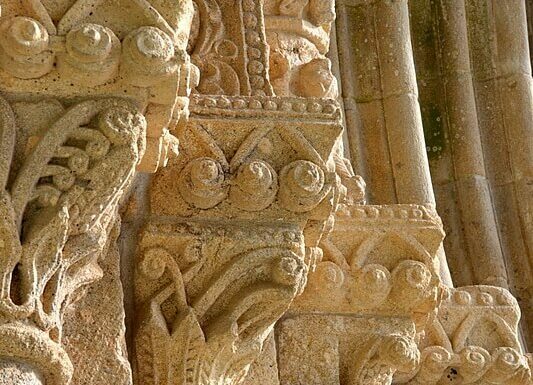 This distinctive style and structure became popular in the churches and monasteries that sprang up in north and central Portugal during the 12th and 13th centuries following the reconquest from the Moors. During this period of transition, new parishes were established wherever there were sufficient farms to sustain them; a minimum of 15 to 20 farms would be linked to each church or monastery. Although most of these religious buildings have been altered over the centuries, you can still find delightful architecture and sculptures nestled in beautiful countryside. An excellent example of this type of rural parish church is St. Genes of Boelhe, a tiny but typically Romanesque structure surrounded by beautiful green countryside that’s still being farmed after all these years. It’s now used solely as a funerary chapel but the fact that it’s still standing is almost a miracle. When a larger, more modern parish church became necessary in the 19th century, it was standard practice to use the already consecrated ground, even if that meant destroying the existing building. Luckily, the plot for the tiny church of St. Genes de Boelhe was too small so they left it standing and built a brand new church opposite. Miguel Torga, one of Portugal’s most famous writers, described the original church as “um brincedo divino“, a divine toy. It’s easy to understand where he was coming from. It is not only cute but also has the most magnificent carvings around the door and supporting the roof. If you look closely at the sculptures on each side of the arched entrance, you can see the contrast between good and evil represented by a man with friendly animals on one side and with fierce beasts opposite. I found this little church on the Route of the Romanesque in the Sousa Valley. To be honest, I’m less interested in the layout and structure of the buildings from this period than the decorative stonework. A distinctive feature of the Romanesque style is the use of figurative sculptures, especially around the entrances. My interest in these pretty botanical patterns and weird and wonderful figures led me to plan a trip to the Sousa valley where a specific route has been developed to showcase these local treasures. Although it’s possible to find them just by following the brown road signs, you may need to make arrangements with the key holder to get inside (see the practicalities below). The former Benedictine monastery of Paço de Sousa has seen many incarnations over the years. Fortunately, much of the decorative stonework created in the 12th and 13th centuries remains, including the bevelled frieze that runs along the walls and some impressive sculptures. Among my favourites is the iconic bull that faces the figure of a man across the doorway, symbolising in turn both strength and wisdom. Paço de Sousa’s claim to fame is the magnificent tomb of Egas Moniz which depicts his remarkable story. The carved stone slabs you can see are actually from two different centuries and places and his tomb wasn’t assembled in this way until the 20th century. For those not familiar with Portuguese history, Egas Moniz was a nobleman who raised the first king of Portugal, Dom Afonso Henriques, from a young boy. Some claim he was actually the boy’s father. DNA aside, Moniz was a true man of honour. When the king of Leon held D. Afonso Henriques and his people under siege in Guimarães, Moniz negotiated the withdrawal of Spanish troops by promising that Henriques would submit himself as a vassal to the king of Leon. Upon Henriques’ refusal to bow down to the Spanish, Moniz delivered himself, his wife and children with nooses around their necks to Toledo, the capital of Leon, as recompense. The king was impressed by the man’s sense of honour and pardoned him, sending him back to Portugal where he later died a natural death. Both the journey to Toledo and Moniz’s actual deathbed are illustrated on the sides of his tomb. The entrance to the monastery’s church boasts some fabulous Romanesque carvings but various structural additions and decorative changes have since been made and the interior is mostly a showcase for 18th century Baroque and Rococo excess. My guide from the Romanesque Route, José Augusto Costa, had told me to prepare myself for the wow factor and he wasn’t exaggerating. As we explored the church, José pointed out the vestiges of previous decorative features which were blocked off or destroyed to make way for more modern effects. Thankfully, the 16th century frescoes are still clearly visible. Other highlights for me include the beautiful wooden statue of Our Lady of Ascension and the sneak peak behind the altar which felt like going backstage and provided a birds eye view of the church from the upper platform. While the decorative fashion of this era isn’t my cup of tea, there’s no denying the quality of the workmanship in the ostentatious chapels, organ and altarpiece. The monastery’s strategic location at the intersection of many of the medieval roads that criss-crossed northern Portugal meant that it also served as a shelter for pilgrims and travellers. Even today, there are two marked walking trails you can take from just outside the church. Having already said goodbye to José and keen to squeeze in a short country walk before setting off again, I opted for the one that said ‘Burgo, 0.9 km. The road took me past several stations of the cross and a Roman road, vineyards and orchards before reaching a small village. Typical country sounds of crowing cockerels, barking dogs, birdsong and wood being chopped mingled with the scent of freshly cut grass and wisteria blossom. For such a small village, I was surprised to find a choice of accommodation including a campsite and a restored manor house. There are several other walks marked from the village, including the Way of St James. Sadly, I had no time to explore any further. Next time. The Romanesque Route is well signposted and established in the Sousa valley and has more recently extended into the neighbouring Tâmega and Douro valleys. Look out for the brown signposts with an arch and you’ll be directed to the closest site to you. This could be an imposing monastery, a quaint little chapel or even a bridge. If you want to plan your visit more specifically and check opening days and times, you’ll need to consult the website, pick up a leaflet and map from a tourist information or official Romanesque interpretation centre or use the free mobile app. If possible, hire an official interpretor via the website to not only get you access to the interior of some of the locked up buildings, but also tell you the stories behind them with passion and humour. Alternatively, you can choose a prearranged tour from a range of tour operators which include accommodation and transport and possibly activities like jam-making or local events. Again, consult the official website for details of such programmes and a list of accommodation in the area. I used this book to find more information about other attractions in the area and give myself a break from religious architecture. I managed to incorporate a riverside walk, an art gallery and some beautiful gardens into my trip but double check opening times as I found that some of the information was out of date. Thanks, Sami. To be honest, neither had I until I got hold of a copy of that book and started investigating. I only got to see a handful of monuments this time but there are plenty of others scattered around the area. I’m hoping to visit another of the Douro valley monasteries in September. Lovely introduction to the Sousa Valley, Julie. As so many of Portugal’s stories are new to me, I was especially taken with the background on Egas Moniz as depicted on his tomb, and the organ face and pipes at Santa Maria de Pombeiro Monastery. Both places are now on my every-growing list for a future visit! Thanks, Anita. I’d heard of Egas Moniz before but I didn’t know his story until I went to Paço de Sousa so it was an interesting journey of discovery for me, too. I didn’t manage to get inside the monastery at Cête but it looks as though it has pretty cloisters and another elaborately carved tomb. 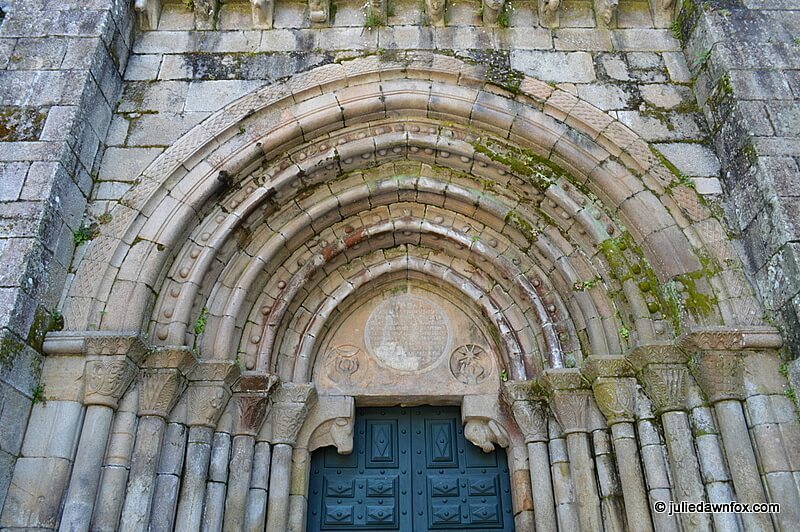 Bravães Monastery near Ponte da Barca would be another one to add to the list if you’re in the area. Apparently there is an association with St Genes here up at Our Lady of the Mount church in Lisbon, where there is a stone throne belonging to this very saint that legend predicts an easy birth will be granted to any heavily pregnant woman who sits upon it. Interesting rose windows and Templar crosses in the architecture too with that elusive number eight featured in them. They so reminds me of some of the features in Tomar, the Seat of the reinvented Templars AKA the Portuguese Order of the Knights of Christ. Fascinating article that would make any tourist interested in History so want to visit, thanks Julie for sharing this will us all. Thanks, Mary, glad you liked it! I had no idea that St Genes had such a helpful throne – I’ll have to have a look next time I’m in Lisbon, although thankfully, I’m not in need of his special assistance! I always learn something new and interesting about Portugal from your articles. Thank you for that. Great pictures, as always! Thank you for saying so 😀 I always learn a lot from researching them so it’s a win win situation.